Only the 80s – Addicted to Love? 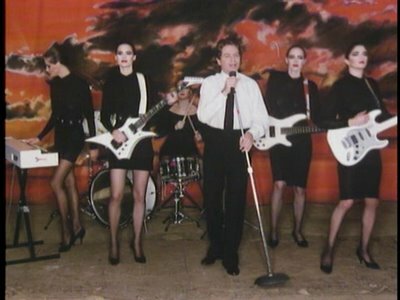 From what I have read on the net (and it IS difficult to verify), the girls were NOT Robert Palmer’s idea. So who were the models? The model on the keyboard was Susie Verrico. She was in the reality TV show Big Brother UK in the UK in 2006. The models in the video are (from left to right) Patty Kelly, Julie Pankhurst, Mak Gilchrist and Julia Bolino with Kathy Davies at the back on drums. Oh, and to finish off, they did not know how to play the instruments which was no great secret but their simple presence worked.